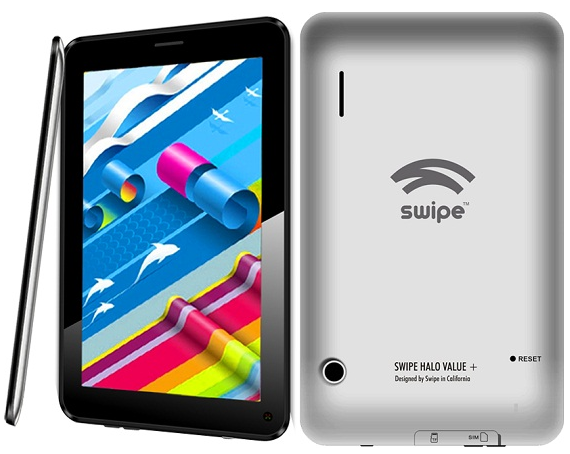 Swipe has launched another budget tablet, Swipe Halo Value+ which is the successor of Swipe Halo Value tablet which is presently selling at Rs. 6,990. This new tablet has been launched at Rs. 6,699 for the 512 MB RAM variant and Rs. 6,999 for 1 GB RAM variants. This tablet is powered by a 1.2 GHz Dual core processor instead of 1.5 GHz single core processor in its successor. As mentioned above you will get two RAM options and 1 GB instead of 512 MB for extra 300 INR is a pretty good deal. The internal storage is 4 GB and can be extended to 32 GB using MicroSD card. The Display is 7 inches in size and sports 800 x 480 (WVGA) pixels which is not much and if you are willing to spend around 1,000 more tablets like Micromax Funbook Mini P410 will offer you better 1024 x 600 pixel resolution. On the software front this tablet runs on Android 4.1 Jelly bean operating system. Swipe Halo Value + comes with a 2 MP camera at the back and a VGA camera at the front for video calling. The tablet is 11.3 mm thick which is average for 7 inch tablets and it weighs 380 grams. The battery capacity is 3000 mAh which is less compared to the predecessor tablet with 3400 mAh battery. You won’t get 3G option, but you will get 2G and Voice calling facility. Other connectivity features include WiFi and Bluetooth 2.0. Swipe Halo Value plus is standard budget tablet and The 1 GB RAM variant at 6,999 INR is a pretty good performance options considering what others are offering. If you are looking for 3G options you can consider Micromax Funbook Mini P410 and Mercury mTAB Star.